Currently it doesn't seem to be possible to get a game from the 2000 coins lootpack, but they can contain diamonds (very low amount and very rare). The names of the lootpacks only describe the exclusive loot for that pack! In most cases you just get something from the general pool for all packs, wich contains Origin/Uplay/GOG/Steam/whatever games. So even if you get the "Full Steam Ahead" pack, you may not get a steam game! If you earned streamcoins by watching their twitch stream, you can buy diamonds with them in their virtual twitch shop. You now get a special golden lootpack after every tenth premium lootpack you open. Warning: If you get the game Bedlam, there's a high chance that it's a duplicate key. Lootboy-support may give you a new pack if that's the case. Unfortunately it happens far too often that Lootboy is handing out duplicate keys, so a lot of people feel uncomfortable with creating public giveaways with the games from Lootboy. So I just created a little group with some rules to make it less risky for the generous givers. DONTPREORDERONGROUPEES saves you 100% on buying trash bundles. LEAVES - The Return from FSA. From the dailies, codes and mobile tasks. 2 per day and sometimes codes . I do not recommend using the "Zula Europe - Mercenary Pack". Even a language change causes client bugs and crashes. Streamcoin codes still sold out, still not 15 gems from the Twitch goal. How long can these possibly take? Last FSA was The Darkness 2. I submitted both the Twitch and Instagram screenshots and contacted Lootboy support because I didn't see diamonds credited, and they told me my submission wasn't valid....for some reason? I asked them to know why it wasn't valid (considering I provided exactly what they asked me, and I'm also a paid Twitch Prime subscriber on their channel) but they didn't reply at all. I'm thinking on giving up on this thing, got 13 packs so far and I didn't get a single game I was able to redeem, because all I got were preaviously given for free titles. It's nice some people manage to get 10/50€ Steam wallet codes here, I'd be happy to just get one game which wasn't already free on Humble, Steam, DHL or similar sites. And yeah, the fact they didn't restock the streamcoins gems (after they removed the 10 and 50 gems option) is baffling, let's see them provide a very limited amount of those codes in the future to limit people access them. they will probably restock on monday or Tuesday . 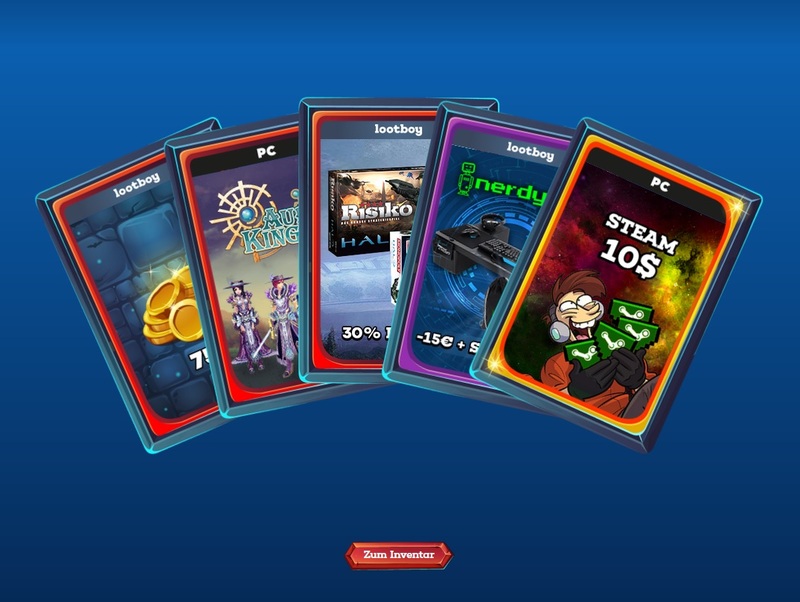 Which other LootPack did you chose to pick? The last FSA gave me Crookz – The Big Heist and sure I was pleasantly surprised. Prior to that I only got Humble freebies. And i actually clicked right on the corner to show my nickname . The problem was the card wasnt edited for it so the insta instruction were on it . I took a screenshot with the chat-options open, which shows an username. But then got "task completed, 0 diamonds granted" in return. And so far no sight of the 15 promised ones. Had the same problem. Wrote to support, got my diamonds. That's indeed suspicious, but was it a successful login or just a failed attempt? Successful, an attempt made from China. The only reason I had a Twitch account is for Lootboy so I really don't see where else it could be from but like I said I could be wrong. The timing is really suspicious though. Anyway I changed my password as soon as I saw the e-mail and I really don't see what they could have got out of it since I don't really have anything linked to it. Ok, I think it's coincidental and unrelated to LootBoy. Question is where the attacker got your account data, and I honestly have no idea. It reminds me a bit of Epic Games accounts which are also frequently under attack by Chinese hackers, and it's equally mysterious to me how they get the account info. Yeah luckily your Twitch account is not of any value to thieves but it's still something to be concerned about. Yes, that's why I thought I would write it here just in case. I don't have anything of value on it but other might so better safe than sorry. Apparently had 200 of these, so got 2 FSAs, second had a 10eur wallet card! Got Introvert Quest. Only a matter of years to get something decent. Not that it meh, it's just was given away too many times before. Most people have it already. Here's your "new" game for the following two months. Great game, but I'm pretty sure that everyone who'd play this game has it already. 20$ for steam from FSA! So lucky! Nice :) Only got 5$ one time. "Only"? I'm soon 80 packs in and haven't gotten Steam wallet even once (did get "State of Mind" once, so there's that at least). I'm curious has anybody try the Raising Hell LootPack. I was wondering if the game were mostly Steam key too? I tried once, and I received The Walking Dead: 400 days DLC. That's probably the most definitive proof for me that they're recycling farmed bundle keys. Why is this particular game such a definitive proof for you? Command and Conquer was in the EA bundle, I think it was even the 1$ tier, so probably they just bought many copies of those bundles in order to give away keys. This might be true. Or they have an external source which is responsible for "obtaining" those cheap games. It doesn't really matter, but LootBoy almost kills it for me with these freebies from FSA packs. What I find to be even more annoying is getting games for Uplay, Origin or GOG from FSA packs. Dunno, I still need to get a game which wasn't free elsewhere without the need to jump through holes like you need to do with Lootboy. Even the (only) Premium pack I managed to get came with a free game (I can't remember what game was, maybe I posted it in thos thread when it happened). I think at least they should consider the option to avoid getting the same game twice in those lootboxes, because getting the same free games again and again is annoying and depressing, I got two Knightshifts which is pretty much always free from DHL, got Culling of Cows or other bad games massively given away from Indiegala and so on. Because the Humble Origin Bundle and Amazon.com are literally the only places that Origin keys for this game have ever been sold. Maybe you're right, and they're just buying keys in bulk from freebie farmers and bundle resellers. That's a given by now, but at least it's better than a duplicate Bedlam key. Conqueror's Blade Beta key: uhjMH5sDT?